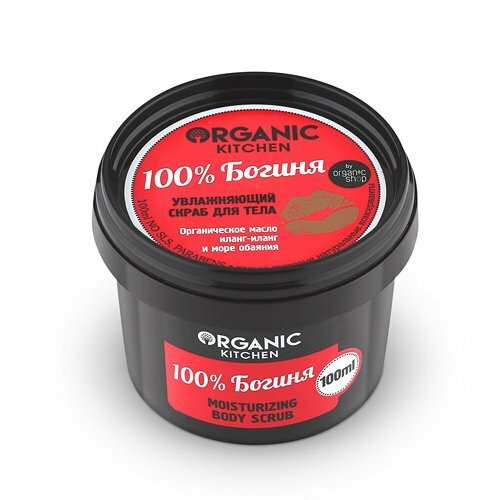 100% Goddess Moisturising Body Scrub is produced by the Russian beauty brand Organic Shop for its Organic Kitchen series. The product is formulated with organic ylang-ylang essential oil known for its rich yet delicate aroma. It gently removes dead epidermal cells and helps to keep your skin hydrated. Paraben free. Organic ylang-ylang oil contained in the scrub deeply moisturises your skin and locks in the moisture, preventing dry patches and flaking. It provides a rejuvenating effect and improves skin elasticity, makes your skin smoother and firmer. The scrub is enriched with amyris essential oil, early-purple orchid extract and melon cactus juice. These ingredients provide your skin with nutrients and help to keep it hydrated. Directions. Apply a small amount of scrub onto wet skin, massage, rinse with warm water. Ingredients. Aqua, Cellulose, Glicerin, Xantham Gum, Sodium Hydroxide, Organic Cananga Odorata Flower Oil, Amyris Balsamifera Bark Oil, Orchis Mascula Extract, Melocactus Juice, Benzoic Acid, Sorbic Acid, Parfum, Beta-Carotene. Want to buy 100% Goddess Moisturising Body Scrub? Call us or submit your order via our web site!